Kim Kramer was kind to send me the wines from Kramer Vineyards Whole Cluster Trial. 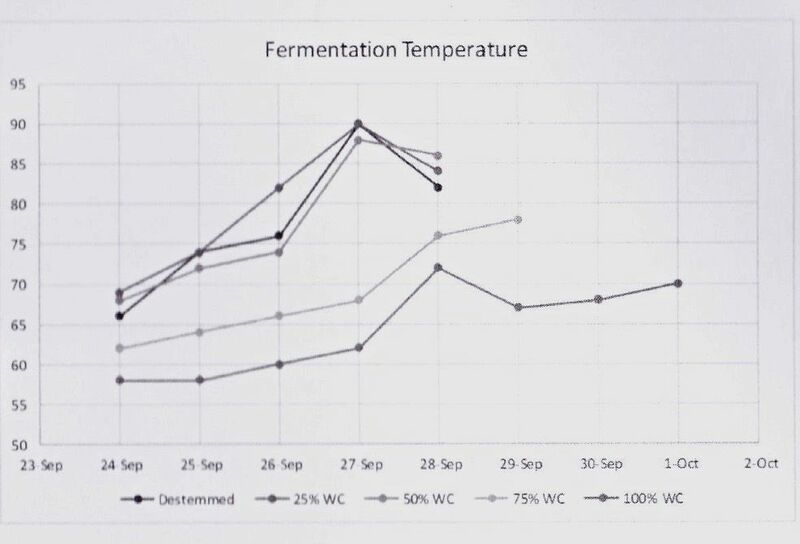 The purpose of the trial was to see what percentage of whole cluster fermentation was most suitable for the winery’s estate vineyard. All grapes were sourced from the main block of the estate vineyard Pinot Noir and harvested September 20 & 21, 2014. The vines are both own rooted and grafted planted between 1985 and 1995, consisting of Wädenswil, Pommard, and Gamay Beaujolais clones. Five tons of grapes were harvested by hand and separated into five vats with different quantities of whole clusters ranging from 0% to 100%. All lots underwent a 4 to 7-day cold soak and inoculation with RB2 yeast. After fermentation began, the vats were pumped over and punched down twice daily and pressed to dryness. After pressing, the wines were aged in older French oak barrels until bottling in the winter of 2016. 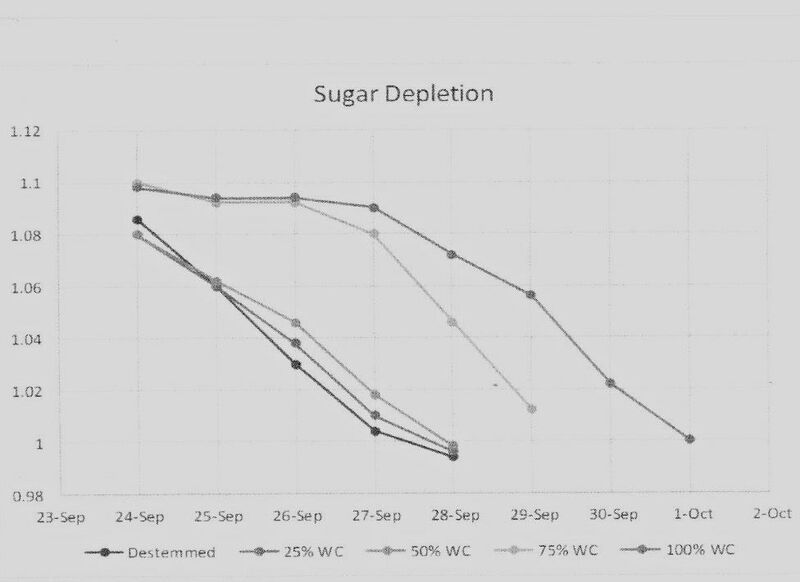 The two charts below show fermentation temperatures for each wine and sugar depletion rate for each wine. The more whole cluster inclusion, the lower the fermentation temperature and the slower the fermentation. CONTROL: 2014 Pinot Noir Estate. Harvest Brix 21.4º. 100% de-stemmed, aged 10 months in French oak barrels, 25% new. Final chemistry: 13.0% alc., pH 3.46, TA 0.67. Wine #1: 0% whole cluster. 12.4% alc., pH 3.51, TA 0.64. Shy, but pleasant aromas of berry fruits and savory herbs. Primarily fruity (cherry and berry) with only slight savory notes and tannins. Wine #2: 25% whole cluster. 12.4% alc., pH 3.43, TA 0.74, pressed October 1, 2014. The nose is similar to the 0% whole cluster wine. Noticeably more intense fruit expression and more tannin. Wine #3: 50% whole cluster. 12.6% alc., pH 3.80, TA 0.68, pressed October 4, 2014. Very appealing aromas of spice and floral perfume. Very good intensity of red and blue fruits with slightly more tannin and more finishing power and length. Wine #4: 75% whole cluster. 12.9% alc., pH 3.73, TA 0.50, pressed October 5, 2014. The nose is quite grounded in earth and floral perfume. Brighter fruit, some earthiness, more tannin and more finishing length. Wine #5: 100% whole cluster. 13.2% alc., pH 3.61, TA 0.59, pressed October 13, 2014. Lovely aromas of spice and rose petal. Fruit brightness seems less and the wine is slightly vegetal. There is noticeable tannins and a very slight astringency. My conclusion was that somewhere between 50% and 75% whole cluster seemed optimum for this wine in terms of aromas, fruit brightness, structure and finish, four years after the vintage and two-and-a-half years after bottling. 25% whole cluster added more fruit intensity and tannin but not more desirability. The 100% whole cluster wine may also turn out to be quite good if given more time in bottle. This tasting was carried out in May 2018 with a small group of winemakers and a sommelier. 2014 Domaine De La Coté la Coté Sta. Rita Hills Pinot Noir 12.5% alc., 820 cases, $90. 0.5 acres planted in 2007 to California heritage selections, high vine density. Ambient yeast fermentation. Winemaker Sasha Moorman. Very light ruby red color in the glass. Aromas of spice and burnt tobacco. Lighter in weight with red cherry, spice and tobacco flavors, finishing with great intensity. Bright acidity. Winemakers thought too much oak overlay in this wine, detracting from the whole cluster inclusion. 2015 Big Basin Vineyards Alfaro Family Vineyard Santa Cruz Mountains Pinot Noir 13.5% alc., 100 cases, $60. 16-year-old vines planted at 588-730 feet in sandy gravelly loam in Corralitos. Clones 115, 667 and 777. Aged 15 months in French oak barrels, bottled unfined and unfiltered. Winemaker Bradley Brown. Moderate garnet color in the glass. Aromas of darker fruits and leaf. Nicely composed with mid weight flavors of darker fruits along with a savory vegetal thread that is more complimentary than intrusive. 2015 Whitcraft Winery Pence Ranch Pommard Clone Sta. Rita Hills Pinot Noir 12.4% alc., pH 3.68, $62. Eastern Sta. Rita Hills location with diverse, well-drained soils. Pommard clone. Williams Selyem yeast, minimal sulfur, bottled unfined and unfiltered. Winemaker Drake Whitcraft. Moderately light garnet color in the glass. Aromas of spice, cherry, cologne and clay. Light to mid weight flavors of cherry fruit with a vegetal thread that compliments. Bright acidity. 2015 Carr Vineyards & Winery Hillside Whole Cluster The Yard Vineyard Sta. Rita Hills Pinot Noir 14.0% alc., 50 cases, $70. Vineyard planted in 1998 in sandy loam soil with significant limestone content. Clone 667. Aged 18 months in French oak barrels, 15% new. Winemaker Ryan Carr. Moderately light garnet color in the glass. Aromas of very ripe fruit including raisin and prune. An array of purple berry fruit flavors with noticeable tannins and some finishing length. The group felt the marked ripeness of the fruit obscured any whole cluster inclusion character. 2016 HIBO Alder Springs Vineyard Mendocino County Pinot Noir 14.2% alc., 75 cases, $45. Vineyard planting begn in 1993 by Stu Bewley. Clone 459. Aged 10 months in French oak barrels. Winemaker Jason Driscoll. Dark garnet color in the glass. Aromas of well-ripened fruit with a touch of oak. More appealing on the palate with an array of purple and black berry fruits and muscular tannins. Some astringency on the finish. 2016 Kutch McDougall Ranch Sonoma Coast Pinot Noir 12.0% alc., $59. Vineyard is 3.5 miles from Pacific Ocean at 935-1,030 feet elevation, 1.7 miles north of Hirsch Vineyards. Soils are Graywacke and sandstone. Clones 114, 115. Native primary and malolactic fermentations. Aged 12 months in neutral French oak barrels. Moderately light garnet color in the glass. Lovely aromas of rose petal, spice and cologne. Bright cherry and raspberry flavors with an exotic spice accent. Modest tannins, bright acidity and welcome finishing length. I felt this wine showed the best expression of whole cluster inclusion. The tannins were reigned in and the wine was very approachable. 2012 Archery Summit Whole Cluster Cuvée Willamette Valley Pinot Noir 13.5% alc., $85. Estate fruit. Native yeast fermentation. Winemaker Christopher Mazepink. Moderately light garnet color in the glass. Nicely perfumed with aromas of spice, eucalyptus and dark cherry. Well-balanced, with a black cherry core of fruit. Sleek tannins and a slight herbaceous thread. Wouldn’t guess this was 100% whole cluster (not confirmed). 2012 Big Table Farm Resonance Vineyard Yamhill-Carlton Willamette Valley Pinot Noir 14.7% alc., 326 cases, $48. Last vintage as vineyard was sold to Louis Jadot in 2013. Winemaker Brian Marcy. Moderate garnet color in the glass. Soaring aromas of spice, dark fruits and tobacco. Luscious and generous on the palate, with integrated tannins and an amazingly long finish. 2013 Tendril Wine Cellars C-Note Yamhill-Carlton Willamette Valley Pinot Noir 14.0% alc., 102 cases, $100. Aged 18 months in French oak barrels. Winemaker Tony Rynders. Moderate garnet color in the glass. Deep cherry aromas with a hint of oak. Robust black cherry fruit flavor with a hint of tobacco. Minimal oak input with a notably long finish. Whole cluster well integrated in this special wine. 2013 Guillén Family Wines Adrian Reserve Willamette Valley Pinot Noir 12.6% alc., 75 cases, $40. Clone 667 planted in 2005 at Vista Hills Vineyard, Block F. Natural yeast fermentation. Aged on the lees 11 months in 100% new, light toast French oak barrels. Winemaker Jesus Guillén. Moderately light garnet color in the glass. Inviting aromas of red cherry, spice and burnt tobacco. Light to medium weight in style, with plenty of spiced red cherry fruit to satisfy. The tannins are very modest and a bit of oak adds pleasure. Whole cluster inclusion very evident in this wine. 2014 White Rose Estate White Rose Vineyard Dundee Hills Willamette Valley Pinot Noir Corked. 2015 Guillén Family Wines Damian Winemaker’s Cuvée Willamette Valley Pinot Noir 13.8% alc., 73 cases. A barrel selection. Pommard and Dijon 667. Aged 12 months on the lees in 100% new French oak barrels. Filtered at bottling. Winemaker Jesus Guillén. Light ruby red color in the glass. Aroma of dark raspberry and cherry. Soft tannins, with delightful flavors of cherry and berry, nicely spiced. Noticeable whole cluster inclusion. 2014 IOTA Cellars Pelos Sandberg Vineyard Whole Cluster Eola-Amity Hills Willamette Valley Pinot Noir 14.0% alc., 94 cases, $44. 11.5 acre non-irrigated vineyard. Clones 777, 667, Wädenswil (25% each). Aged 10 months in 25% new French oak barrels. Winemakers Don and Johanna Sandberg. Moderately dark garnet color in the glass. Aromas of toast and tobacco with little fruit. Imposing oak toast and guiacol/smoke flavors overlay the black cherry fruit core. Whole cluster inclusion largely hidden. 2015 Winter’s Hill Vineyard Block 10 Whole Cluster Dundee Hills Willamette Valley Pinot Noir 14.2% alc., 98 cases, $49. 35-acre vineyard, 20 acres are original planted in 1990. 525-750 feet elevation, Jory soil. Pommard clone. Winemaker Delphine Gladhart. Light ruby red color in the glass. Predominantly savory on the nose with shy cherry fruit aromas. Explosion of cherry fruit on the palate with an incredibly long finish. Whole cluster beautifully integrated. 2015 Ayoub Estate Whole Cluster Dundee Hills Willamette Valley Pinot Noir 13.3% alc., pH 3.60, 120 cases, $75. Sourced from the 4-acre estate vineyard. Pommard and Dijon clones. 5-day cold soak, mostly pump overs, 28 days on skins, aged 11 months in French oak barrels, 25% new. Winemakers are Mo Ayoub and Robert Brittan. Light ruby red color in the glass. Inviting marriage of savory and red fruit aromas. Very seductive on the palate with fresh red fruit flavors, balanced tannins and a gracious finish. Would not have guessed this wine was 100% whole cluster other than its freshness. 2015 Evening Land Anden Seven Springs Vineyard Eola-Amity Hills Willamette Valley Pinot Noir 12.5% alc., $100. Pommard and Wädenswil clones from original plantings in 1984 on own roots. Aged ;in 100% new Ermitage oak barrels. Unfiltered. Winemaker Sasha Moorman. Lightest color in this flight. Lovely perfume of rose petal, red cherry and spice. Lightly weighted and soft in the mouth, but with imposing red cherry and berry flavor, supportive tannins, some oak overlay, and an extraordinarily finish. 2016 Broadley Vineyards Shea Vineyard Yamhill-Carlton Willamette Valley Pinot Noir 13.8% alc., 300 cases, $56. Clones 777 and Wädenswil. Native yeast fermentation in open-top French oak fermenters. Aged 12 months in French oak barrels, 30% new. Winemaker Morgan Broadley. Moderate garnet color in the glass. Engaging aromas of darker red fruits and spice. Really spectacular with an array of fresh dark fruit flavors, some supportive tannins and fully satisfying finish. Has the balance to age. 2016 Flâneur Bon Vivant Chehalem Mountains Willamette Valley Pinot Noir 14.2% alc., pH 3.79, TA 0.55, 122 cases, $50. 75% Belle Promenade Vineyard and 25% Flâneur Vineyard. Native yeast fermentation, aged 12 months in French oak barrels, 25% new. Winemaker Grant Coulter. Moderately dark garnet color in the glass. Slightly green aromas with added notes of tobacco. Fruit is on the riper side but the wine has an air of sophistication with invigorating tannins but no astringency. 2016 Big Table Farm Pelos-Sandberg Vineyard Eola-Amity Hills Willamette Valley Pinot Noir. 13.9% alc., 285 cases, $62. 11.5-acre non-irrigated vineyard. Pommard, 777 and Wädenswil clones. Unfined and unfiltered. Winemaker Brian Marcy. Moderately light garnet color in the glass. Energized aromas of rose petal, spice and a hint of smoke. Highly enjoyable, with a solid core of black cherry fruit and a smoky thread typical of this vineyard. Modest tannins and some length on the finish. 2014 Analemma Atavus Columbia Gorge Oregon Pino Noir 13.8% alc., 90 cases, $44. Vineyard has been dry-farmed since its inception in the late 1960s. 1700 feet elevation. 100% Mariafeld clone, 100% whole cluster fermentation. Moderate garnet color in the glass. Revealing aromas of black cherry, wilted rose, spice and tree sap. Middleweight in style, with a hearty core of dark cherry and dark berry fruits with an interesting spice accent. Well-structured, with fine-grain tannins leading to mild astringency on the finish. Veers from the ordinary in a good way. The color of the wines varied from light to moderately dark so this is a non-issue. None of the wines had a significant herbaceous component. When present, it was often a pleasant savory addition and never detracted from the wine. Whole cluster inclusion seems to work best when grapes are picked earlier and there is minimal to modest new oak barrel treatment. Very ripe fruit and a high percentage of new oak obscure the subtleties of whole cluster fermentation. It would seem that high fruit ripeness and therefore more lignification of stems is not a worthwhile goal. Whole cluster aromatics and flavors were not overwhelming in most wines and added character and textural interest in many cases. Increased tannins were evident in several wines, but they were texturally soft and appealing rather than grainy or astringent and would be expected to add longevity to the wines. Although 100% whole cluster inclusion can increase acidity, none of the wines showed skewed acidity in the finished wine. California wineries that are committed to significant whole cluster fermentation of Pinot Noir: Big Basin Vineyards, Calera Wine Company, Domaine de la Côte, Kutch Wines, RAEN Winery and Whitcraft Winery. 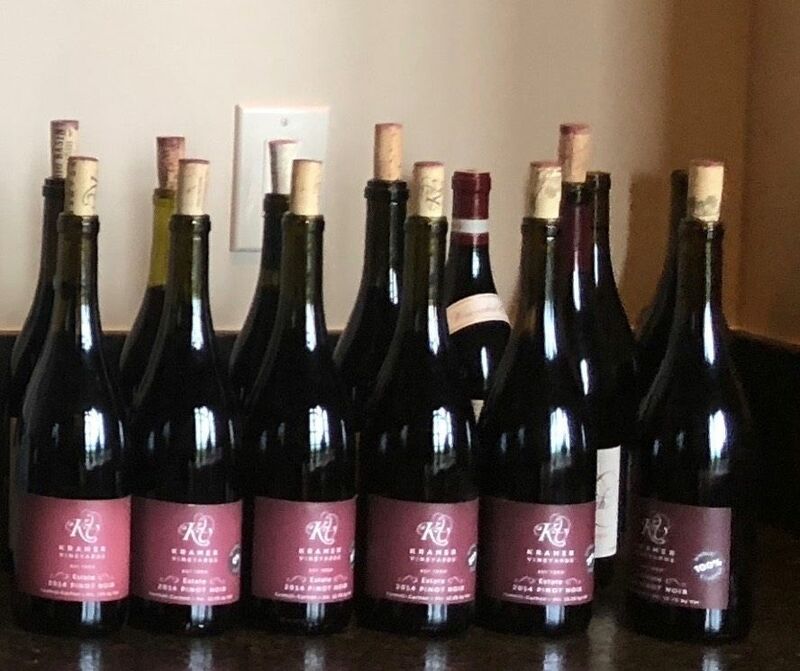 Oregon wineries that are committed to significant whole cluster fermentation of Pinot Noir: Big Table Farm, Broadley Vineyards, Cristom Vineyards, Evening Land Vineyards, Guillén Family Wines, Hundred Suns Wines and White Rose Estate.